The Denver Nuggets came into their home matchup with the Portland Trail Blazers desperate for a win. 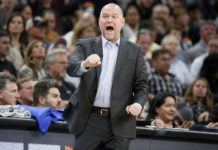 Denver, who were losers of two-straight and four of their last six games coming into the game with the Trail Blazers, needed to get back to, “feeling good about themselves” as Nuggets’ head coach Michael Malone said in his pregame press conference prior to the game. To say the first quarter was a game of runs would be a vast understatement. The Nuggets jumped out to a 10-2 lead as Jamal Murray paced Denver with five points in the first two possessions of the game while boos rained down upon Jusuf Nurkic like mortar fire on the other end of the floor. Portland did answer the Nuggets’ 10-2 run with an 8-0 run of their own leading to a timeout by Malone. Denver went from executing at a high level to playing with very little energy for the next few possessions. Denver proceeded to go on a 7-0 run to take control of the game out of the timeout but proceeded to give the Trail Blazers another 7-0 run of their own. The Nuggets and Trail Blazers traded buckets and stops to close out the first quarter, and Denver eventually went into the second quarter with a lead of 20-19. The energy was solid for the most part and Denver managed to carry a lead into the second quarter even though they shot an abysmal 28.6 percent from the field. Wilson Chandler decided that he would keep the Nuggets above water in the second quarter. On the back of two incredible blocks, fantastic defensive pressure, and timely scoring, Chandler was able to keep Denver involved in the slug-fest with Portland. The slow and physical game between Denver and Portland continued and at halftime, the score was 49-45 in favor of the visiting Trail Blazers. 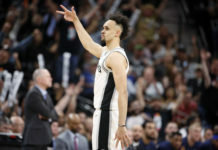 Denver came out in the third quarter looking like they had something to prove and that tone was set by Murray, who came out firing on all cylinders. He put up an alley-oop pass to Plumlee to start the quarter, dropped a pass to Jokic that led to a floater, hit a turnaround jumper, and then sliced to the rim for a bucket to give the Nuggets an 8-0 run to start the frame. Murray was not done there. He proceeded to hit two more incredible jumpers and followed that up with a three. Once the three fell, Murray immediately started barking at the Portland bench and, from there, the energy immediately returned to the game. Murray finished the third quarter with 28 points to go with four rebounds and five assists as he led the Nuggets all the way back to eventually take the lead after an and-one from Jokic. Denver eventually went into the fourth and final quarter down just two points as Portland carried a lead 78-76 into the fourth quarter. Denver and Portland continued to trade buckets throughout the fourth quarter but could not close the gap. Every single time that the Nuggets were within one bucket, the Blazers would get a timely bucket. The Nuggets have an x-factor type player themselves though. Where Jokic disappeared, Murray arrived as he continued to battle to keep the Nuggets within striking distance. He continued attacking the basket relentlessly, got to the free throw line, and was putting constant strain on the Trail Blazers defense. His three-pointer with two-minute left tied the game at 95 points. From there — after a couple of awful calls that benefitted Portland — Murray arrived. He hit a three, a layup, got fouled, and hit the and-one free throw to give the Nuggets the lead. This was Jamal Murray’s coming out party. 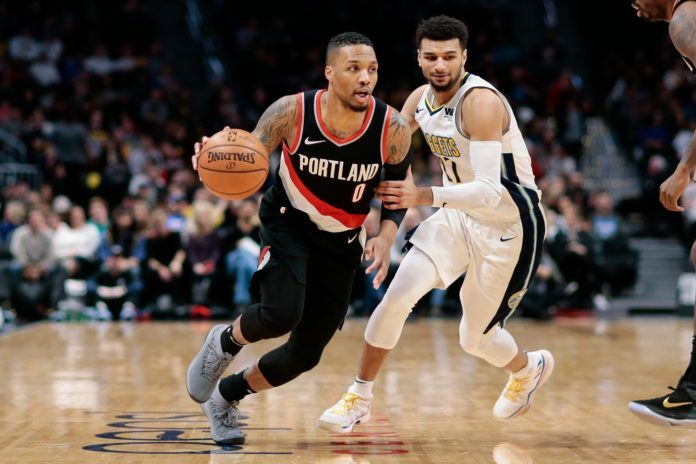 He took over from the opening tip with five-straight points and finished with six-straight points to carry the Nuggets to what is likely the most important victory of 2018 as the Nuggets defeat their division-rival Trail Blazers 104-101. 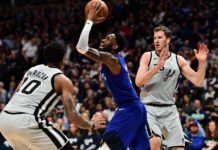 Murray finished with an obscene 38 points on 14-19 shooting to go with five rebounds, and six assists while carrying the Nuggets to a massive win.